Turn off incoming water and RO storage tank valve. Open the ledge faucet and keep it open to relieve pressure. 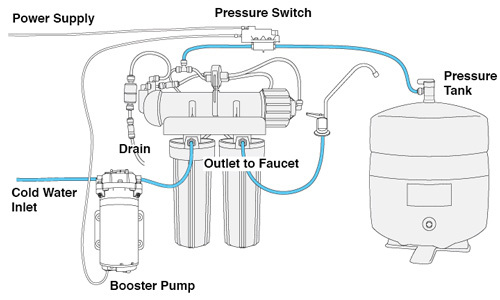 Position the pump so that the inlet tube — the 1/4 tube that supplies water to the RO unit — can be routed through it. Observe the directional arrows on the quick-connect fitting ports at the front of the pump, cut the inlet tube squarely and insert the ends into the appropriate ports. Cut the 1/4" tube that connects the tank to the unit squarely and insert the pressure switch so that the tank water will pass through the switch. Flow direction does not matter. Connect the electrical wires from the pump and the transformer into the switch. The electrical connection will only go one way. If the connections fit, you've got it right. This switch will shut the pump off when tank pressure reaches 40 pounds. Turn the inlet water back on and check for leaks. The unit should now start producing water through the open ledge faucet. Plug in the pump. The pump should come on and water production from the ledge faucet will increase. Reconnect the tank to the system by turning on the valve on top of the tank, then close the faucet and the unit is now in operation. The pump will turn off automatically when the tank is full and resume operation when water is taken from the tank.